Here is a photo documentary of the construction and preparation of my first two SFG boxes. 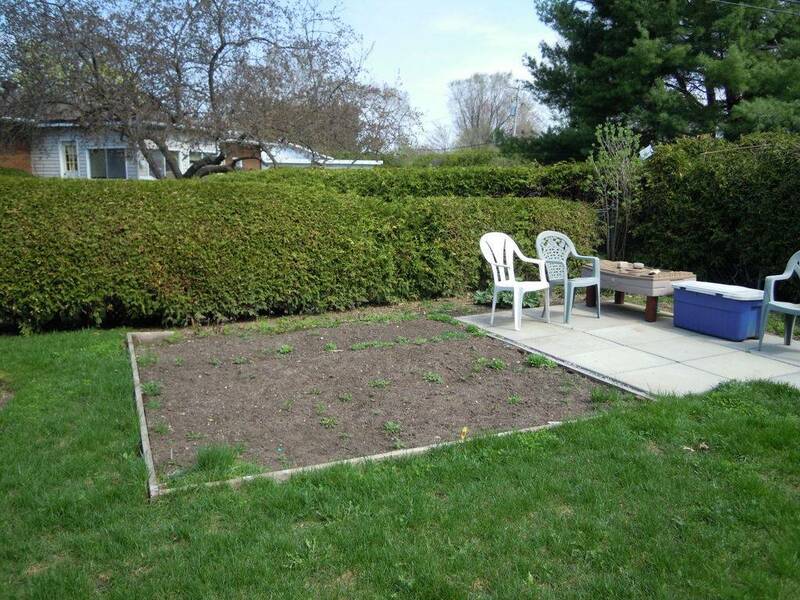 This is the location of the existing traditional vegetable garden. The two boxes will be placed in the front half of this garden. The boxes are made with untreated 2x8 spruce wood. 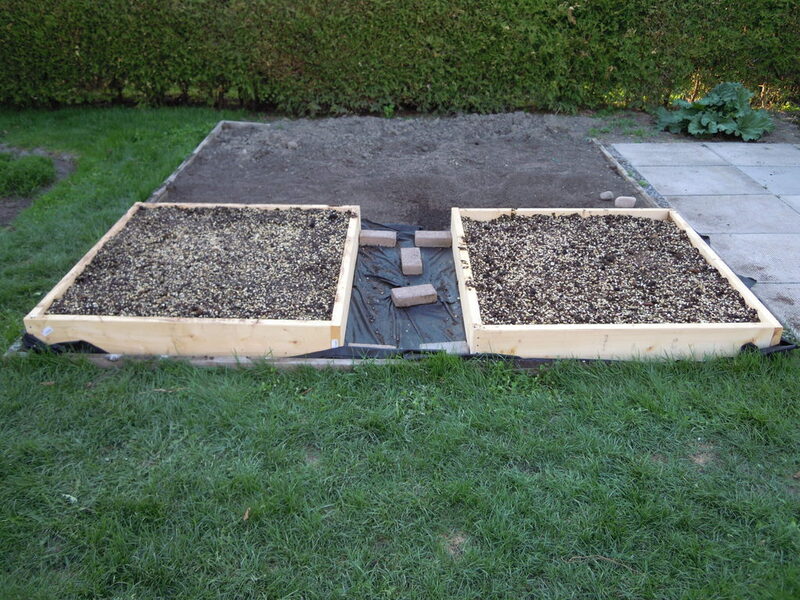 The two boxes in place with weed block underneath. 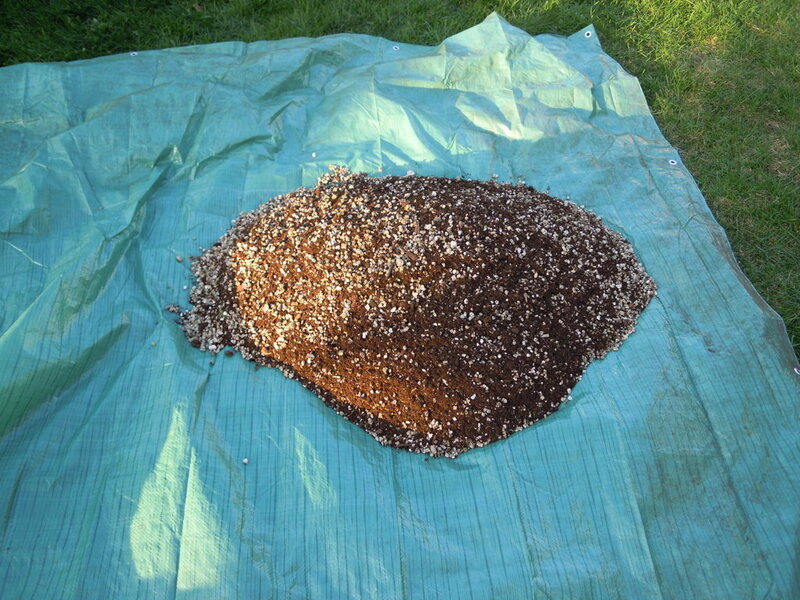 The compost for box #1 is made from 4 types of purchased compost plus composted horse manure from my neighbour. 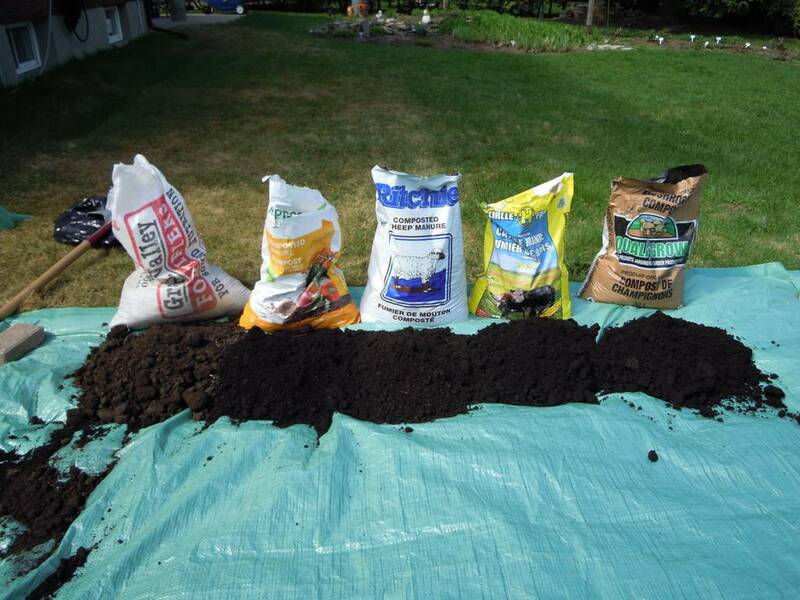 The compost for box #2 is made from 2 types of purchased compost plus composted horse manure plus two parts of home made compost from my composter. A batch of Mel's Mix ready to go into the box. Box #1 filled with Mel's Mix. The two boxes filled with Mel's Mix. The grids are made from metal venetian blind slats held together with 1.5 inch long quarter inch bolts. The bolts add enough weight so that the slats stay in place in windy conditions. The downside to this type of grid is that it is "floppy" and is not easy to take off and put back. I would consider wood grids in the future. 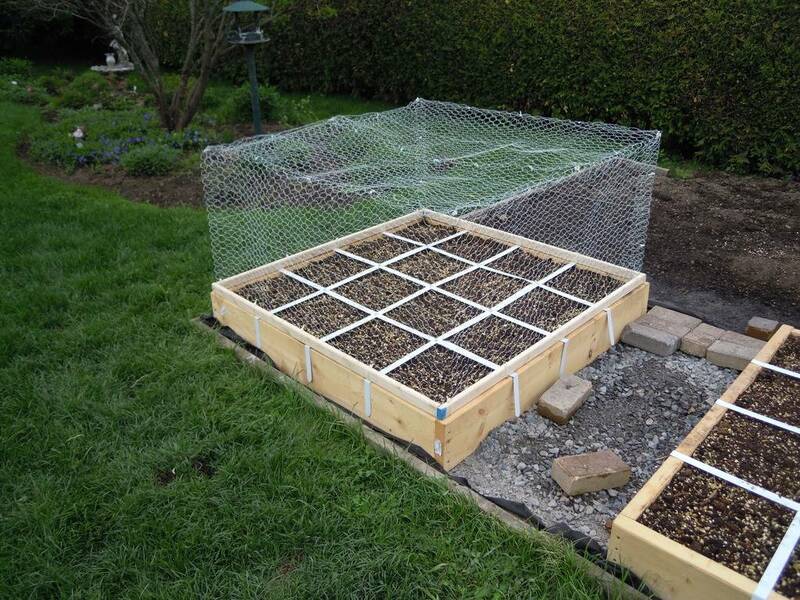 Box #1 has been fitted with a chicken wire cage to keep out the local critters. Box #2 will get a different cage due to the trellis that will go on the north side. Maybe I am biting off more than I can chew (no pun intended). There are things in there that I usually do not grow such as Okra, Cabbage and Eggplant. 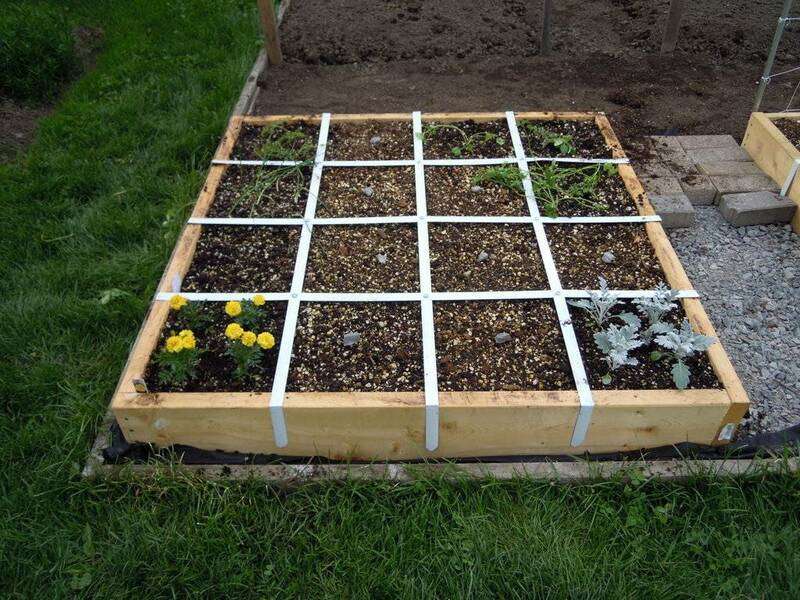 I may sacrifice a couple of the squares given to flowers in order to get in more veggies. 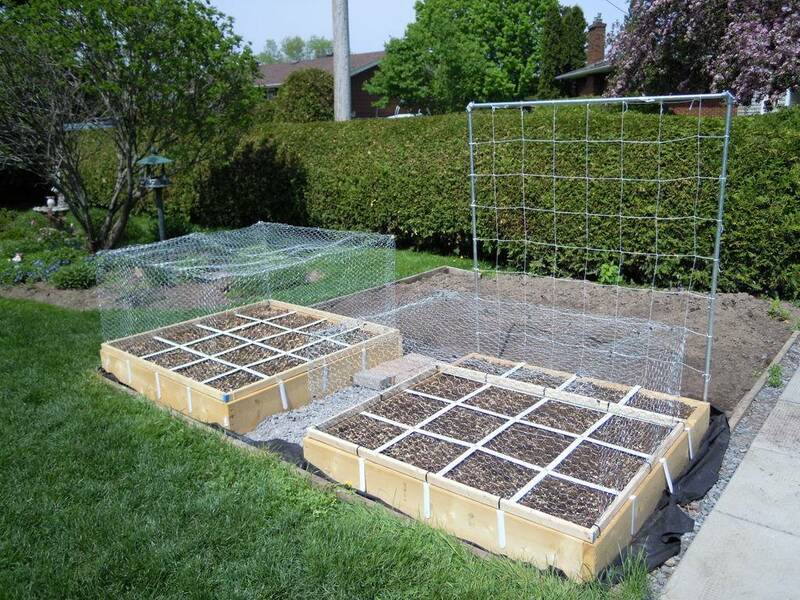 I still have to create the cage for the second box and install the trellis. 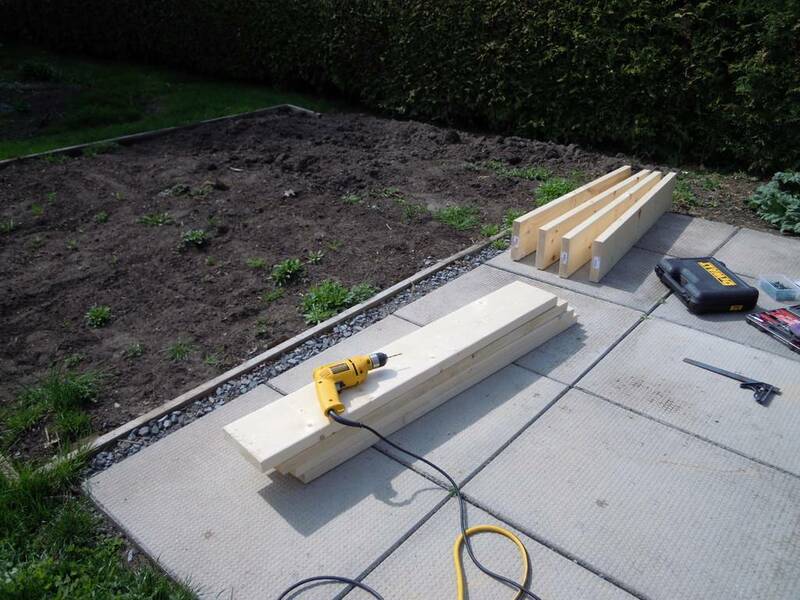 I also have to do some work on the traditional garden which this year will have tomatoes, potatoes and peas. I'm hoping I'm not too late starting the peas but the SFG has been consuming most of my time. That is a wonderful effort, Trolley Driver. Now I am looking forward to seeing your beds planted and growing. I love following others' efforts. @Kelejan wrote: That is a wonderful effort, Trolley Driver. Now I am looking forward to seeing your beds planted and growing. I love following others' efforts. PS Cucumbers 2/square. 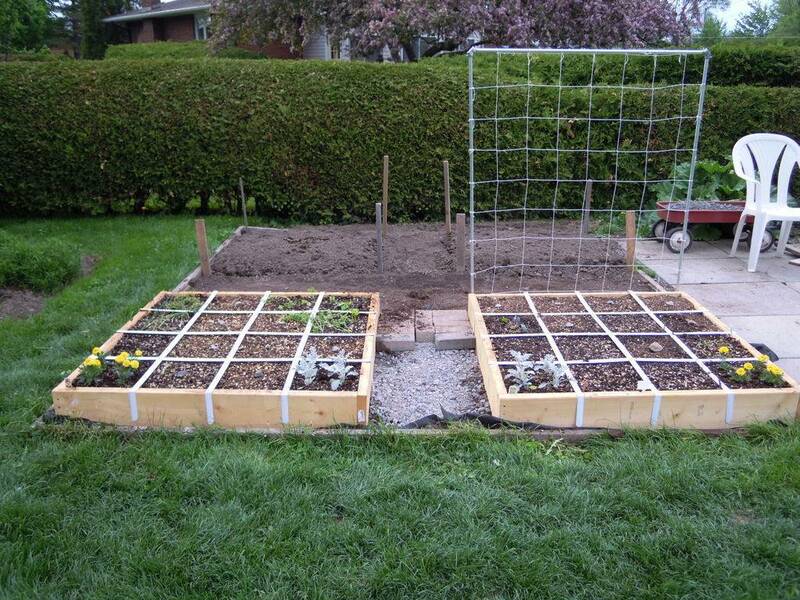 I plant melons and winter squash 1/square and trellis on 8' trellises. This is wonderful documentation of your beautiful SFG in Canada!!!! You'll surely inspire others when they see how neat and tidy this project is. Way to go - now, let's GROW!!!! This newbie to square foot gardening thanks all of you for your ongoing encouragement and advice. Have a wonderful day! +1! It looks so nice & tidy. Thanks for sharing, Trolleydriver! trolleydriver, GREAT job! Nice and neat. I think you will do well with those great looking beds. Keep us posted. To get the day started (Friday May 15, 2015) here we go. Box 2 now has a cage over three rows. This cage is 18 inches high which is six inches shorter than the cage on Box 1. 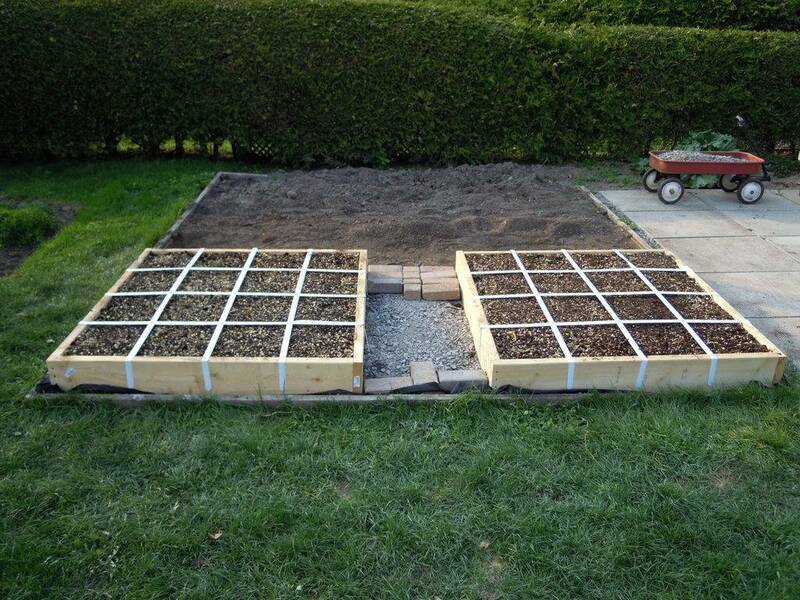 It also does not cover the squares on the north side which will be used for trellised veggies. 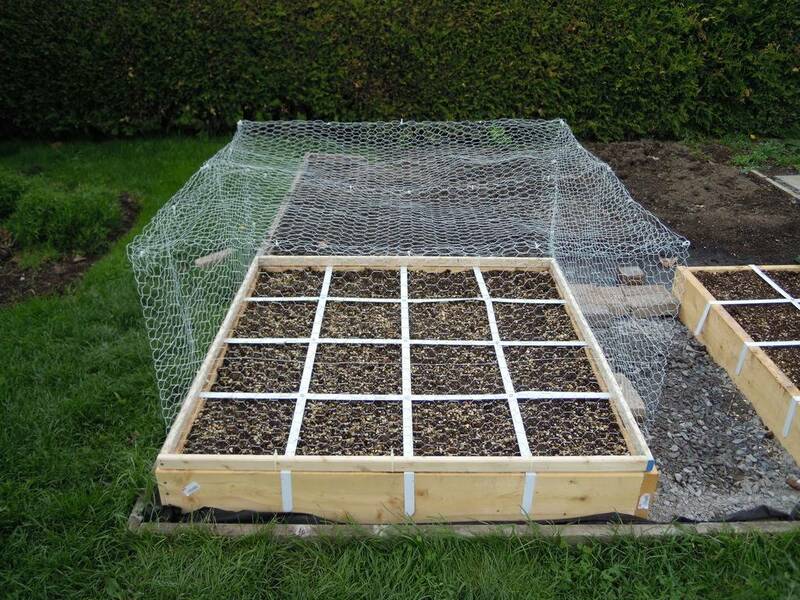 I'll need another way to protect those squares at least until the plants are established. 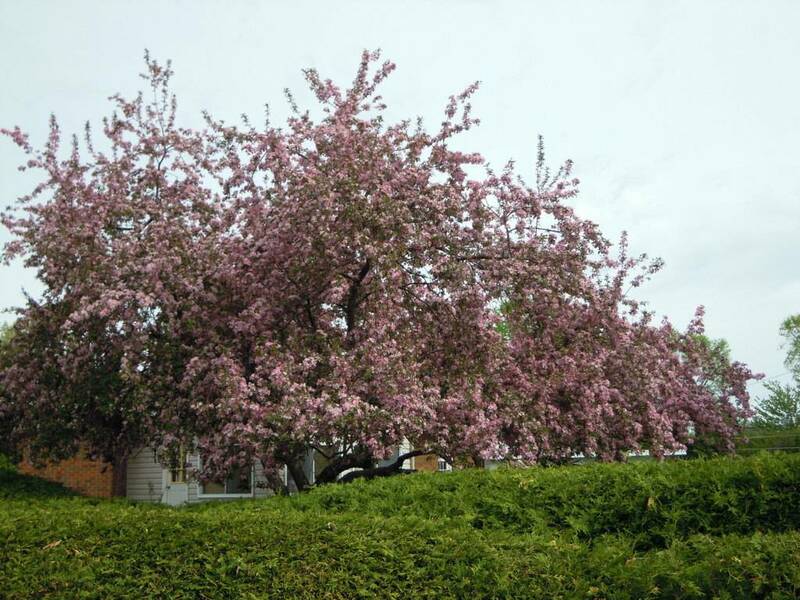 The neighbour's crab apple tree is putting on quite a show behind our veggie garden. 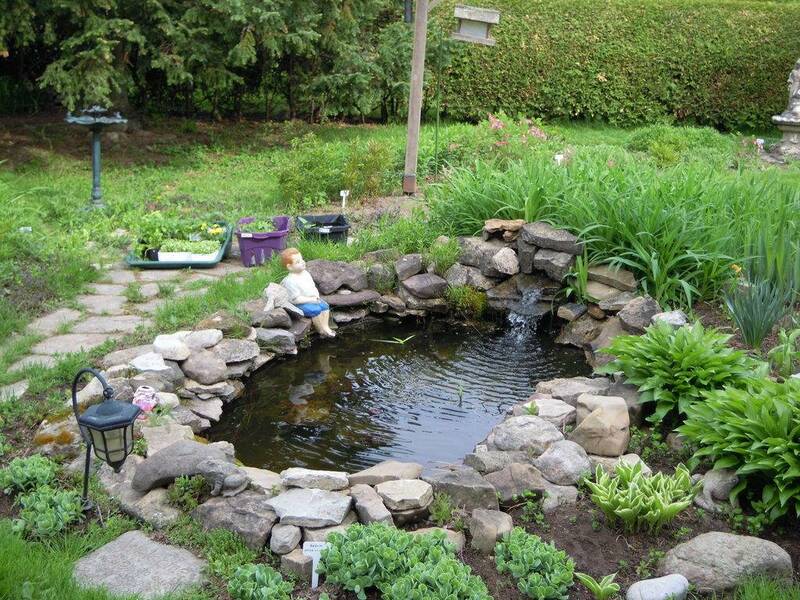 And here is our pond area with some plants in trays/boxes (above the boys head) in the background being hardened off and readied for planting. The vertical frame trellis is now in place. That's just about it for the mechanics. I still need to figure out how to protect the row next to the vertical frame. Now comes the fun part ... sowing and planting. Actually doing all the work on the boxes, Mel's Mix, grids and vertical frame has been fun as well. Very nice, trolleydriver. It gives me inspiration to get moving. Today was planting day. 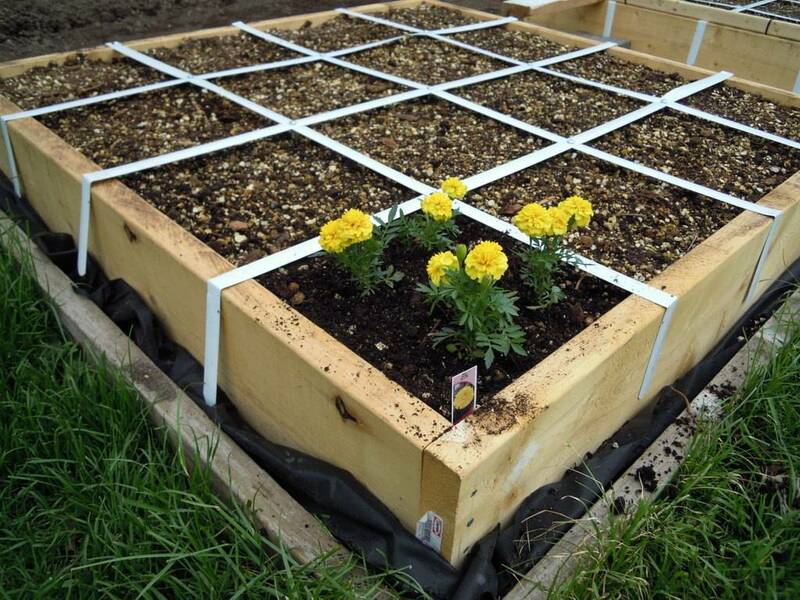 My 2 SFG boxes are veggie gardens but the honour of getting planted first in the first square goes to 4 yellow marigolds. 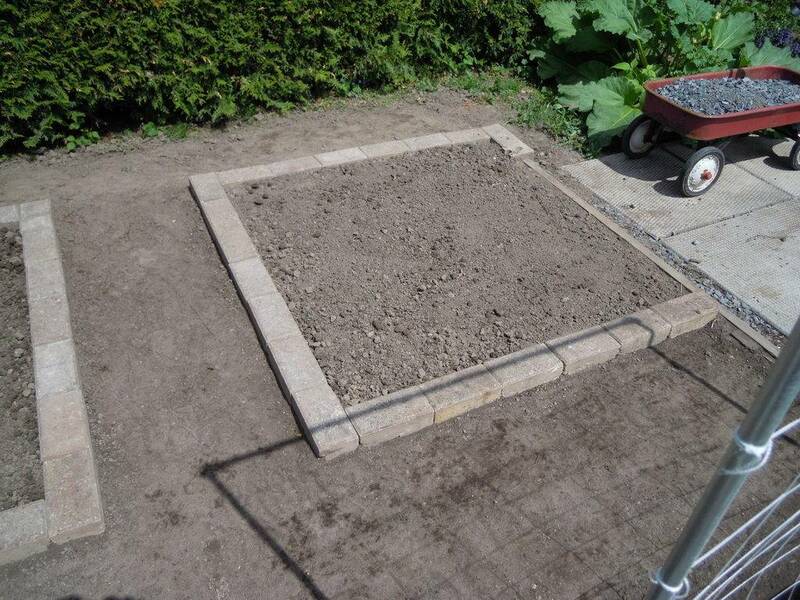 A total of 2 squares were planted in marigolds and 2 with dusty miller. The remainder are veggies and herbs. 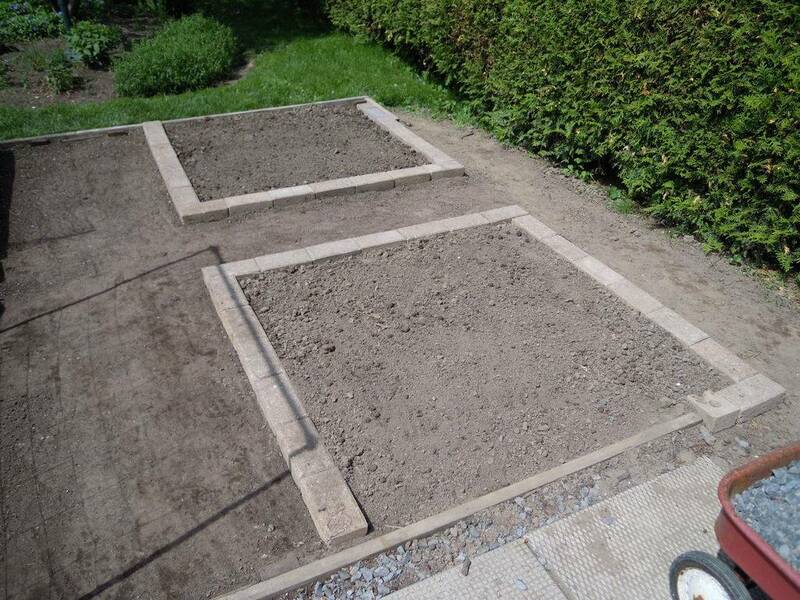 Some of the other squares were planted with seeds (radish, carrot, lettuce, swiss chard and spinach), transplants (spanish onions, red cabbage, chives, thyme, oregano, parsley). There are still 15 empty squares. Here is the winner (marigold) of the first square to be planted. Runner up goes to dusty miller. Here is what it looks like at the end of the day. I put a rock in the middle of each empty square. You may notice some stakes in the soil behind the boxes. They are located in my standard veggie garden but I decided to carry on the 4x4 theme. I'll surround those areas with boards or bricks and then remove the stakes. 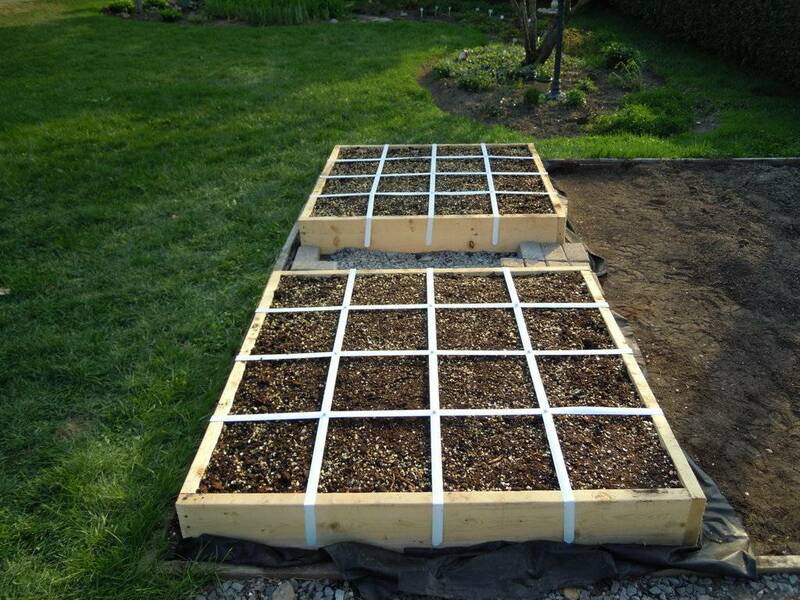 Those areas will be planted primarily with tomatoes and peppers. Tried to do some work on the veggie garden today but have not gotten very far. The goal was to put a brick edge around the traditional gardens. At 3 pm the temperature was 28 Celsius (82 Fahrenheit) with over 60% humidity. We even had some rain (100% humidity) an hour or so earlier. Call me a wimp but those hot and humid conditions drain me very quickly. I have to keep retreating from the garden especially when the sun comes out and beats down on me. We are expecting a big thunderstorm this evening. The summer weather has come on much too quickly here in Ottawa. @trolleydriver wrote: Call me a wimp but those hot and humid conditions drain me very quickly. I have to keep retreating from the garden especially when the sun comes out and beats down on me. Looking terrific. I still have not been able to get all the goodies I need. Got my composter and, interestingly, there is a warning in the booklet not to use wood ash in it. I presume it is because the ash creates lye as it decomposes (the basis of great grandma's soap making) and the lye just might attack the plastic of the drum shortening the life span of the beast. I will heed the warning. I have some wire which looks to about the same size as yours. I ordered seeds from source 2. Source 1 was not prepared to put my box number on the package, even though I explained that it is a post office requirement because all mail is sorted into boxes. No street delivery here. Source 2 is in Palmerston, Ont - north and west of Toronto towards Owen Sound. They even use Paypal service, which I prefer - so I had placed my order, paid for it, and had confirmation of shipment in no time flat. It will be here tomorrow. Still have to find more of Mel's Mix ingredients. A variety of composting materials is the biggest problem - but I shall preserver. Some of the seed I ordered produce plants that are said to flower producing blooms that are highly sought after by bees and hummingbirds. I can't see the hummingbirds accessing the flowers too easily through those small openings, so I might have to create a slightly different set of goodies for them - climbing peas. The bees around my property are the substantial types that should be able to squeeze in - I will have to watch them and perhaps enlarge some upper openings a little if needed. Anyhow, we, as they said in an old move, shall endeavor to perservere. Tuesday morning update (May 19, 2015). The crazy weather here in Ottawa continues. Yesterday there was a tornado watch in a town about a one hour drive from my house. We had a severe thunderstorm watch. Neither happened! Now Environment Canada is predicting a low of 0 Celsius (32 F) for this Friday night. Yikes! I'll have to consider how to protect vulnerable plants. 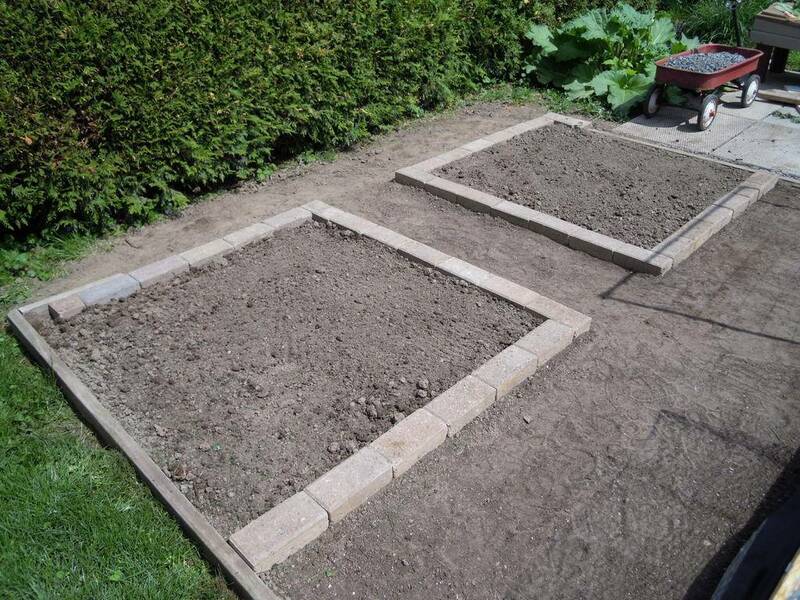 This morning I completed putting an edge around the "traditional veggie garden". My two SFG boxes are in the front (South) part of what was that traditional garden. I decided to continue the 4x4 layout with the remaining part of the garden. The difference is that these 4x4 areas contain only original soil (no Mel's Mix). I have some 4"x8" bricks which were not being used so I took some of them for edging. 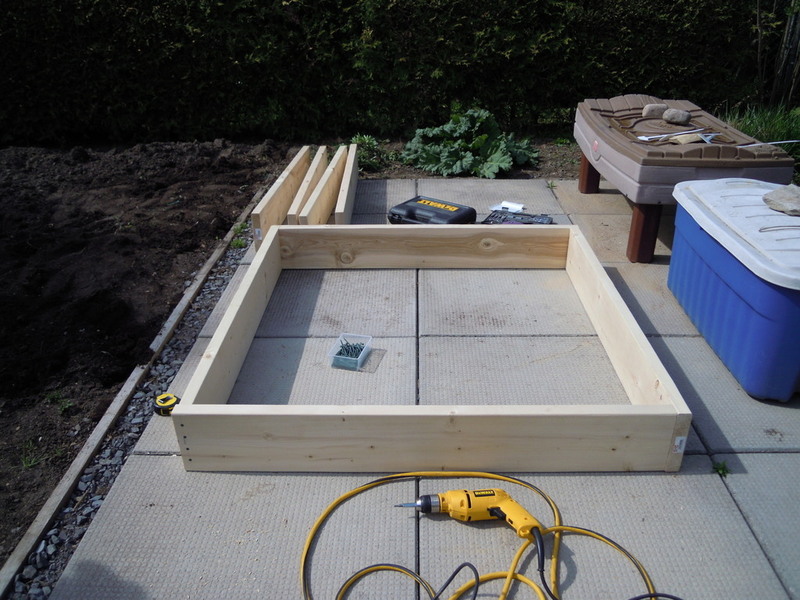 In the photos you can also see part of the wooden frame that surrounds the original garden and which I did not take out when I put in my SFG boxes. 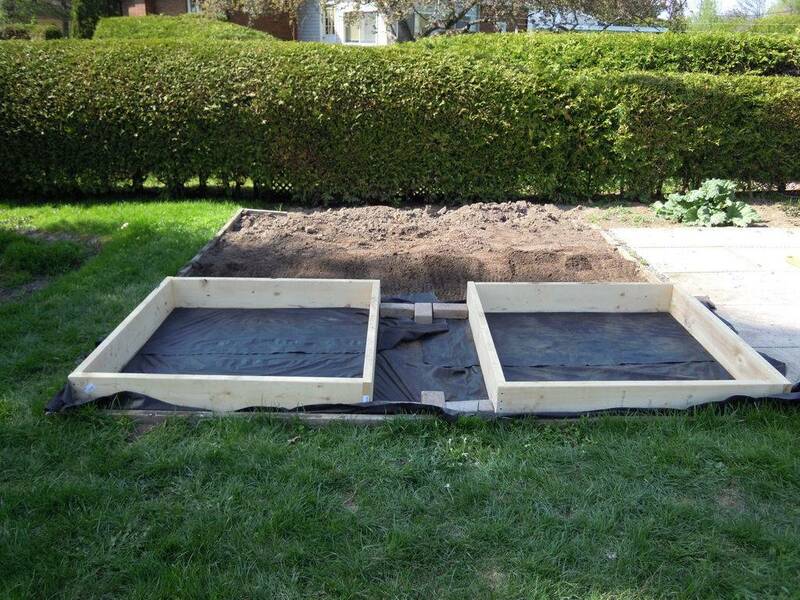 These traditional soil areas will be planted primarily with tomatoes and peppers. I have yet to decide what to use on the paths between the boxes. 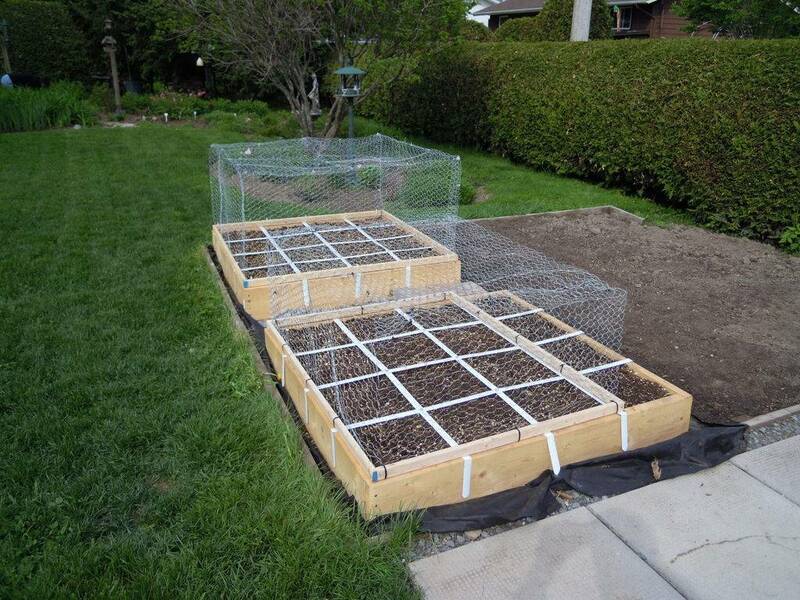 I'm think of putting down weed block and then a layer of rock (e.g., pea gravel). The original cedar wood edging can be seen to the left and to the right where there are no bricks. I'm hoping the SFG trellis (bottom right corner) does not put too much shade on the traditional garden when the plants grow. One more from a different direction. First sign of new life. 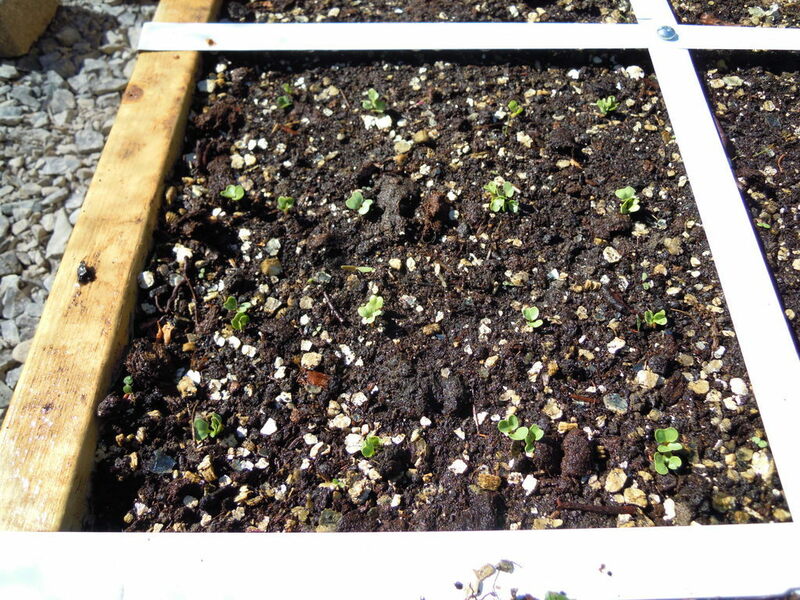 The raddish seeds planted in a square in Box #2 have sprouted on this the fourth day. It's so exciting when the first sign of life appears! And radishes are pretty good for that! Good for you! What else have you already planted? And what are you going to plant in the traditional beds besides tomatoes, flowers, and peppers ? I often put squash, ground cherries, bush beans and /or corn in mine. The above are the plantings for the 2 FSG boxes which have Mel's Mix. It may be a bit ambitious but this first year is more or less experimental to see what grows well. 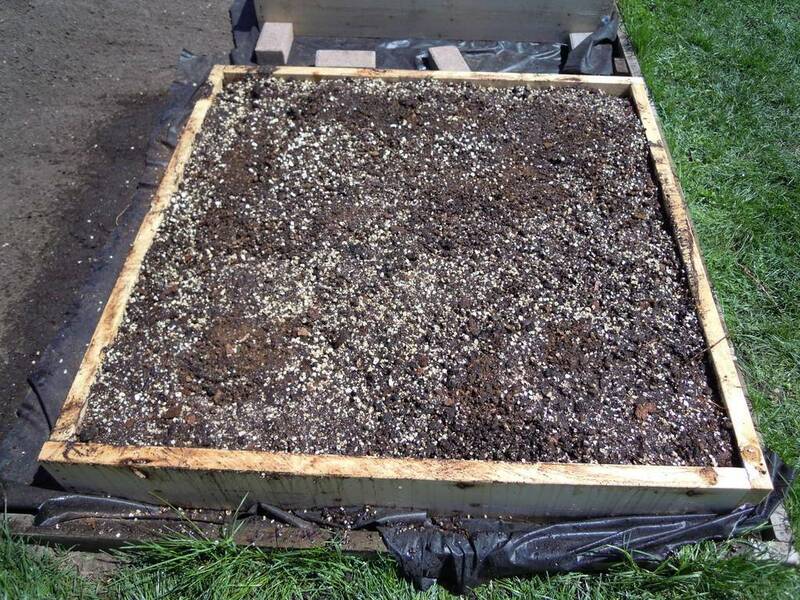 Tomatoes, peppers and perhaps some other crops will go in the 2 boxes that have regular soil. Another area of the garden (not shown in any of the photos) has peas and potatoes. 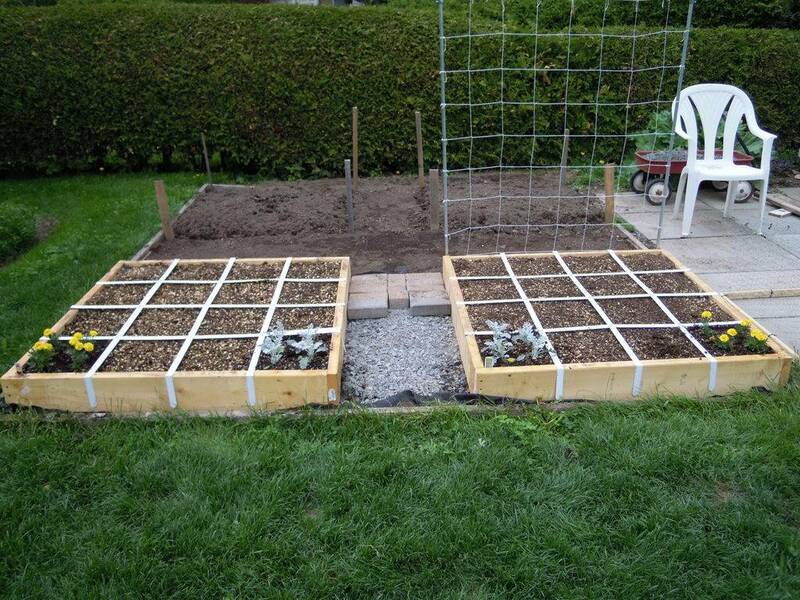 @trolleydriver wrote: The above are the plantings for the 2 FSG boxes which have Mel's Mix. It may be a bit ambitious but this first year is more or less experimental to see what grows well.